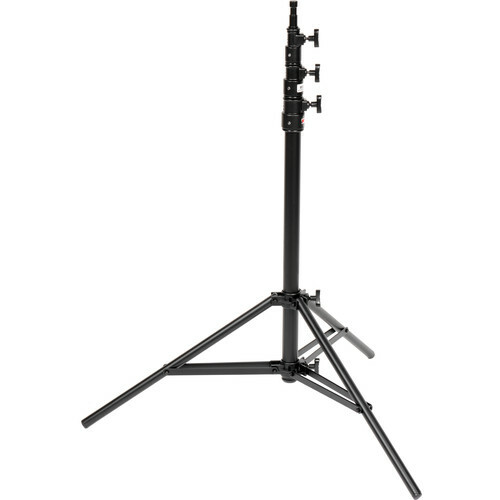 Designed primarily for use in lighting kits, the Matthews Medium Duty Kit Stand with Brake is compact and light weight. This black finish stand employs a brake shoe system for locking off the riser tubes as opposed to pinch castings, thus permitting the use of heavier fixtures. Box Dimensions (LxWxH) 29.3 x 3.0 x 3.0"
Medium Duty Black Kit Stand is rated 4.7 out of 5 by 30. Rated 5 out of 5 by Mark S from Great all metal stand After reading a review here that stated this stand was of all metal construction, I went ahead and ordered it at twice the price of similar stands that incorporate some plastic elements. I can say that this stand is very high quality and surpassed my expectations and have no doubts that will years of use, this stand will outlast stands using lesser materials. The only negative is that given it's collapsed size (29), the leg spread is a little narrow at 32 while similar compact stands offer 36+ quoted spreads. I have not used it outdoors, but the spread and weight allow for a large umbrella to be positioned without fear of it getting tippy. Rated 4 out of 5 by Christine from For the price a great product, however... For the price of this stand you can't beat the quality. As others have pointed out in other reviews, the legs do not have a wide enough footprint to be of use in most applications. This is a good stand however, for a small lighting fixture in a studio or when you are in a tight space and larger stands will not fit. So, this stand should be in your kit if you need a small footprint and do not need it to support heavy loads or boom anything off it. Sandbags a MUST with this stand for safety. It is constructed from aluminum tubes with steel brackets and knobs, no plastic! This is a LIGHT duty stand in my opinion, not a medium duty stand as advertised but it is perfect for the right application. Rated 4 out of 5 by EP-LANYC from SOLID! Excellent stand! outstanding built quality one is to expect from an industry leader such as Matthews. These things are designed to take a beating from studio and on-location demands. Major plus was the entire metal body including the lugs, pins, screws, rivets...everything that counts, and yes, Matthews still stocks replacement pieces if and when these do fail. Though i love the black matte color, its already showing some dings and scuffs since it appears to just be powder-coated. Not a huge issue if you don't mind the patina of a well used light stand, but frankly next time, I think i'll go for the chrome finish instead. Rated 5 out of 5 by Anonymous from Almost Perfect The Matthews light stand was purchased to hold a 41 umbrella, an umbrella stand adapter, and a Nikon SB-800 flash. However, because the stand only has a 32 wide footprint, the off-centered weight of the large umbrella made the stand slightly prone to tipping, especially when fully extended. I'm still pleased with the stand's performance. However, in the future, I'll add weight to the stand's legs or use another Matthews stand with a wider footprint. Despite of this one issue, I give this stand a high rating because of the excellent build quality, brake style extension locks, and portable size. Rated 5 out of 5 by Nathan C. from Very strong for the size This stand is a little bit pricey, but it is built like a tank. It is made from all metal. I have used it with a 10 pound set up which included an Octa box and it did just fine. I would be a little bit leery of using it with 10 pounds at full extension though. Note that you will definitely want to use sandbags with this no matter what light modifier you have attached, this is true especially because the footprint is not as wide as say, a regular 9 foot stand. of course, that smaller footprint is the reason that this stand is so packable, shrinking down to a mere 30 inches. I would recommend this stand for you Strobist guys who need to pack light but who occasionally use larger modifiers on location. Rated 5 out of 5 by Isaac from Awesome for strobists I just purchased a couple of these stands from a local store. This stand is an ALL metal construction with brakes to lock the poles in instead of the less effective pinch clamps found on most stands. This is perfect for the strobist on the go since it's fairly light in weight and collapses to a 30 length for easy portability. This is definately a well built stand in my opinion. In the photos, it looks like the stud on top may be permanently mounted. Is the stud removable? The 5/8 baby pin/stud is part of the top riser and cannot be removed. Would this work well for a Profoto B1X with say a 3 or 4 lb modifier attached? Do you think it would be OK with an arm so I can use for top / hollywood lighting? Should take the weight just fine, Iam not sure about the arm If the are is fully extended it might be too much weight. Would these be sufficient to hold a Kino Flo Diva? Would this work okay with the Profoto B1X + a large, 51 umbrella? I'm only asking because I have older stands rated to handle up to 8 lbs, but bow with a Flashpoint XPLOR 600 with a 36 octabox attached to it, so I'd like to avoid facing the same issue. The medium duty kit stand has a higher rating but if the light is not balanced you will have the same problem. whats the folded length? Smallest length. The folded length is exactly 30 inches. Does this really only weigh 3.5 lbs? Have to ask. Purchased from Matthews before and received stands 5-7 lbs heavier. How thick is it folded up?